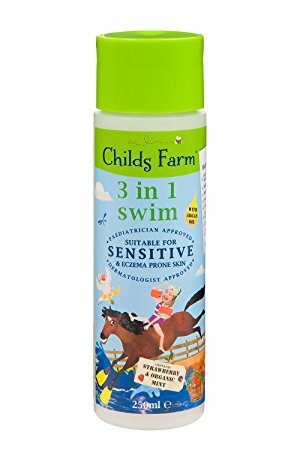 Childs Farm award-winning 3-in-1 swim is a shampoo, conditioner and body wash. Use after swimming to thoroughly clean off chlorine and come up smelling of strawberry and organic mint. Especially formulated to protect and moisturise young skin and hair. Aqua, Sodium Coco-Sulfate, Cocamidopropyl Betaine, Glycerin, Sodium Chloride, Benzyl Alcohol, Lauryl Glucoside, Sodium Lauryl Glucose Carboxylate, Parfum, Guar Hydroxypropyltrimonium Chloride, Stearyl Citrate, Argan Oil Polyglyceryl-6 Esters, Cassia Hydroxypropyltrimonium Chloride, Sucrose Laurate, Lactic Acid, Dehydroacetic Acid, Mentha Arvensis (Peppermint) Oil*, Citric Acid, Alcohol.